The matrix field is the most advanced Field that comes out of the box with TypeRocket. With it you can built totally custom designs. The best example and use case for a matrix field is for building modular designs. Maybe you have just created a single page website with three different sections. The first, is for a large banner of text. The second, is a list of testimonials. The third, is a contact section. By using a matrix field you can take each of these sections and turn them into individual modular components that you can reuse on any number of pages. Take a look at removing the editor for the "page" post type and using matrix instead. This will allow you to start designing the three sections. When you go to add or edit a page TypeRocket debug will tell you that you need to create a matrix group called page_builder. Note: The group name will always be the name of the matrix field. 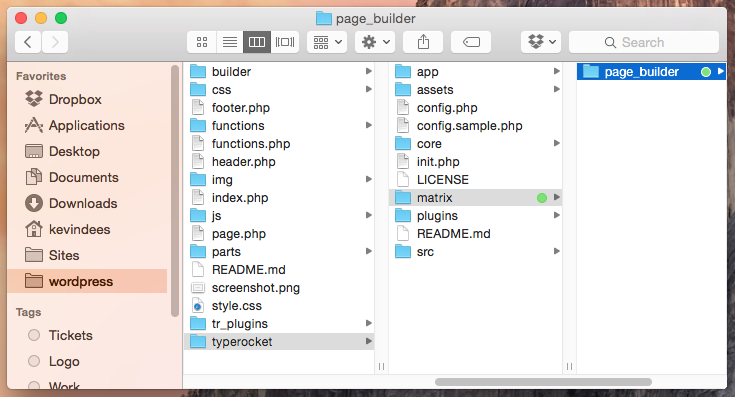 Here TypeRocket is telling you that you need to create a folder named page_builder in the matrix folder you have specified in the config.php file. By default, there is no matrix folder so you will need to create it as well. 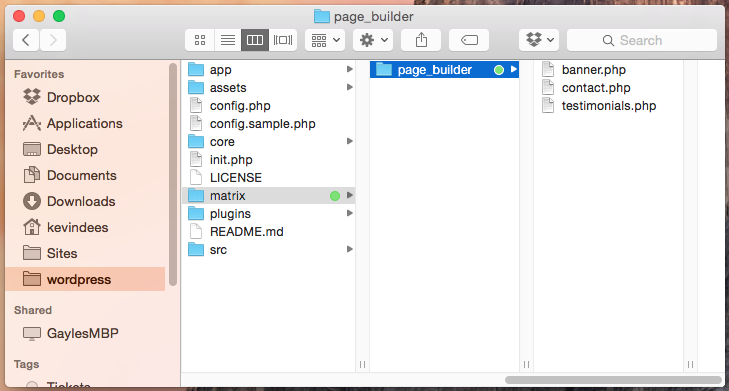 In the typerocket folder where the config.php file is located create a folder named matrix; then create a folder with the matrix folder named page_builder. Now that you have created a matrix group folder you can start adding files to it. These files will be the options used by the matrix field. To build the sections for the single page design you should create three files: banner.php, contact.php and testimonials.php. The Matrix field will pick up on these files and populate the options for you. 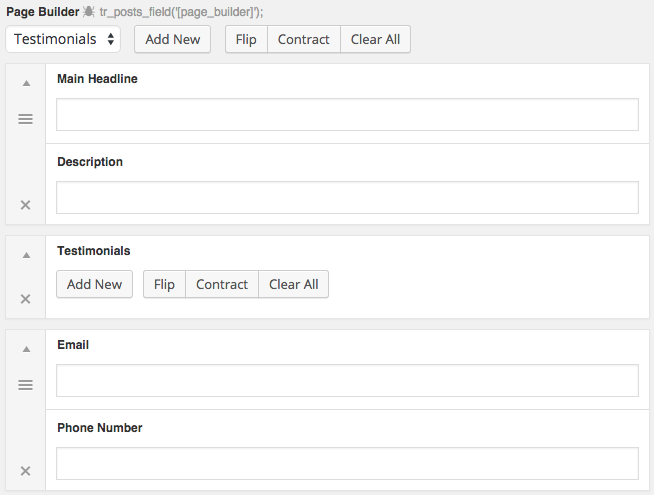 This is what the front-end will look like. Now for the fun part. In each matrix option file you can add fields using the $form variable. The $form variable is an instance of the From object. In the banner.php file you could add fields for a main headline and description for example. For the contact.php file you might create some fields for an email and phone number. For the testimonials.php file you might add a photo of the person, their name and what they had to say. But you want to add as many people as you like so a repeater field is what you will use. Take a look at what you get if you add all three options. 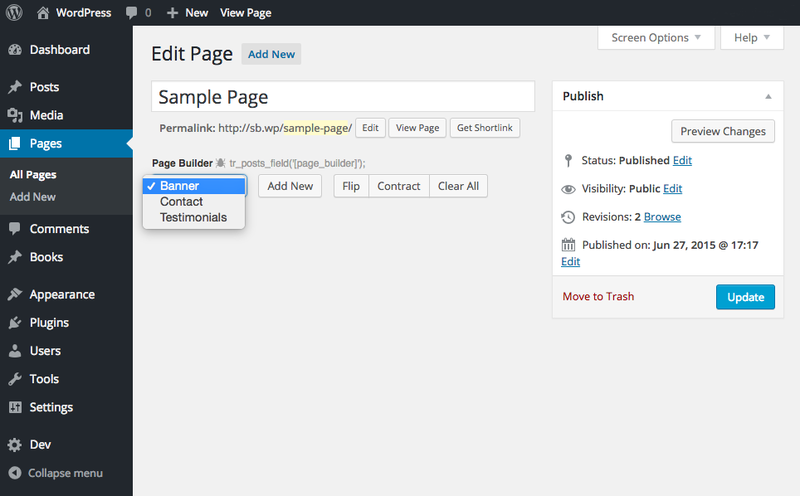 Now you can add custom content to each section and update your design as you like.